Just a short year after its launch the BOLT-68 is already the brands major collection. Featuring an easy to handle – and patented – bayonet system that turns the timepiece into a unique pocket watch, the BOLT-68 has been welcomed by raving enthusiasm. This summer, BOMBERG proposes a new version with BOLT-68 CAMO. Inspired by the nature aesthetics, the BOLT-68 CAMO bares an unusual dial and strap imprinted with a camouflage motif. Colors true to this environment – such as khaki and blue – confirm the masculine and authentic identity of the timepiece. 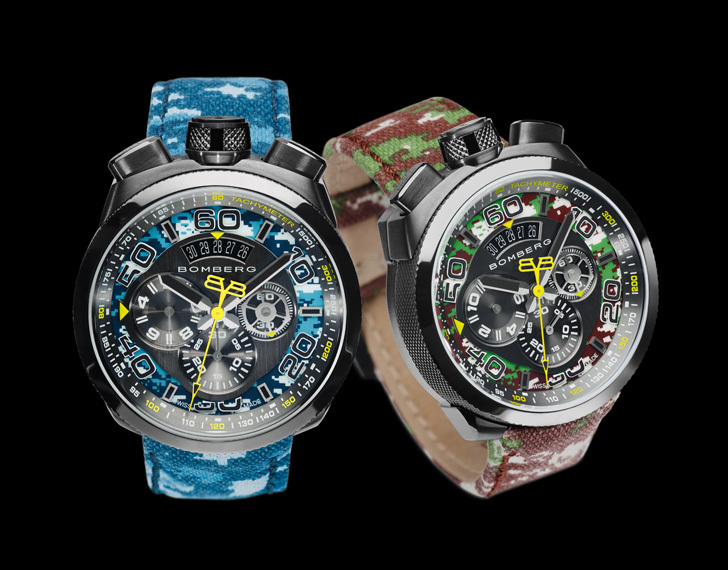 The striking yellow sweep second hand in the center, in contrast to the camouflage motif of the dial, as well as the Gun PVD (stainless steel) round watch case with knurling finishing on the sides, both reinforce the unconventional design of the BOLT-68 CAMO. Available in Quartz Chronograph, it comes – as all models in the BOLT-68 Collection – with a medallion and a chain also in Gun PVD.